Welcome! In an effort to stimulate the country's economy through job creation and capital Bulgaria is offering foreign nationals investment programs that can lead to Bulgaria permanent residency and Bulgaria citizenship. The Bulgarian passport is similar to the passports of Germany, France, or any other EU country; Bulgaria passport holders may live, work or study in any country belonging to the European Union. 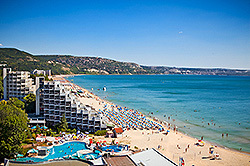 Residency allows the applicant to live in Bulgaria as long as desired. Citizenship may be applied for after 60 months (5 years) in permanent residency status. The applicant purchases government bonds for EUR 512,000 plus legal fees, and may sell the bonds after five years. The processing time for residency is about six months. With "standard processing" an applicant may apply for citizenship after 60 months (5 years) in permanent residency status. The applicant purchases government bonds for EUR 512,000 plus legal fees, and may sell these bonds after five years. The processing time for residency is about six months, and citizenship may be granted after 5 years. (1) Government Bonds Purchase / Fast Track Processing. The applicant purchases government bonds for EUR 1,024,000 plus legal fees, and may sell these bonds after five years. The following provides a summary of the minimum investment requirements. Please use our contact form to obtain a complete checklist of application documents which depends on the number of family members to be included. Step #2: Document Preparation. Should you wish to proceed with an application you would sign a service agreement to allow our associated immigration law firm in Bulgaria to commence the application procedure. The firm will gather all required application documents from you and assist with opening your bank account. There is no need to travel to Bulgaria at this time. Please contact us for a detailed cost estimate or confidential consultation. Our associated attorneys are ready to assist you with attaining your investment objectives and answer any questions you might have about all of Bulgaria's Residency / Citizenship by Investment programs. The following are questions frequently asked about the Bulgarian Immigration by Investment programs. If you don't find your answers here, please contact us at your convenience. Q: What are some of the reasons the Bulgaria citizenship by investment program is attracting so many international investors? Q: What is the minimum investment required to obtain the Bulgarian residency? A: The minimum expense to obtain permanent residency is EUR 512,000 plus legal fees. Permanent residency allows applicants to live in Bulgaria. Residency is granted usually within 6 months of filing an application. Q: What is the minimum investment required to obtain the Bulgarian citizenship (EU citizenship)? A: The minimum expense to obtain citizenship (the European passport) is EUR 512,000 plus legal fees under the 5 year standard processing program, or EUR 290,000 under the 18 months fast track processing program. As a EU citizen you are allowed to live, work, study in any of the 26 European Union countries. With "standard processing" an applicant may apply for citizenship after 60 months (5 years) in permanent residency status. (1) Government Bonds Purchase / Standard Processing. The applicant purchases government bonds for EUR 512,000 plus EUR 15,000 legal fees. The applicant can sell the bonds for about EUR 512,000 after five years. Total cost after sale: EUR 15,000. (1) Government Bonds Purchase / Fast Track Processing. The applicant purchases government bonds for EUR 1,024,000 plus EUR 25,000 legal fees for a total of EUR 1,049,000. The applicant can sell the bonds after five years. financing package for a total expense of EUR 290,000. Q: Will the Bulgaria citizenship automatically grant me European citizenship? A: Yes. Because Bulgaria is a member of the European Union its citizens are automatically European citizens, which means you are allowed to live, work or study anywhere in Europe. A: Yes. All investment options to citizenship allow for one application to cover the husband, wife and all children of any age. Q: As a citizen, am I required to live in Bulgaria? A: No. Bulgaria does not require you to be present or reside in Bulgaria before or after approval of your citizenship application. Q: Under the citizenship program, am I required to own real estate in Bulgaria ? A: No. Bulgaria does not require the applicant to purchase real estate in the country. A: No. When you acquire citizenship under the Bulgaria citizenship program, you and your family enjoy full citizenship for life, which can be passed on to future generations by descent. Q: What is the process to apply for citizenship, and how long does it take? A: Under the "standard processing" program an applicant may file for citizenship after 5 years in permanent residency status. Under the "fast track processing" program the entire process from application filing to receiving the Bulgarian (EU) passport takes approximately 18 months. Q: Does Bulgaria allow me to keep my original citizenship? A: Yes. There are no restrictions on dual citizenship in Bulgaria. A: Becoming a citizen of Bulgaria does not mean the investor automatically becomes a Bulgarian tax resident. However, becoming a tax resident in Bulgaria may be attractive to the investor because of the country's low personal and corporate income tax rate which is only 10%; the lowest in the European Union. Please contact us for a detailed cost estimate or confidential consultation. Our associated attorneys are ready to assist you with attaining your investment objectives and answer any questions you might have about the Bulgarian Residency / Citizenship by Investment programs. Our immigration associates in Bulgaria are working exclusively on Citizenship & Residence matters and will stand by your side throughout the entire application process, from start to finish. The team will work with you until your residence or citizenship by investment application has been approved and you have received your residence certificate or Bulgaria (EU) passport. I am interested in the Bulgarian residency only program, starting at €512,000 plus legal fees. The residency program offers Bulgaria residency and European travel benefits. I am interested in the "standard processing" Bulgarian (EU) citizenship program, starting at €512,000 plus legal fees. This program allows for applying for Bulgarian citizenship and the EU passport after 5 years of residency.